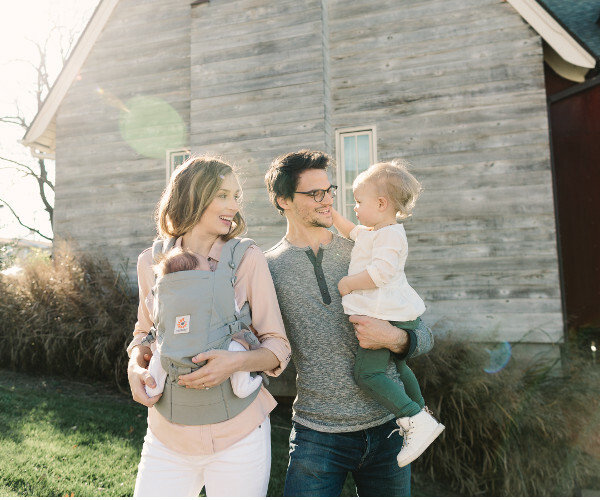 Next month’s release of the all new Ergobaby 3-Position Adapt Carrier is set to make waves, as the Adapt is the first Ergobaby Carrier that doesn’t need a separate Infant Insert for newborns. It’s simply everything you’ll need for ergonomic babywearing – from day one. Mums-to-be, this is one essential piece of baby equipment that needs to be added to your shopping list! We’ve got all the details on when it’s due to hit the stores, and where to get your hands on exclusive colours. There are two big design leaps in the new Adapt Carrier that mean it’s ready to go from newborn stage without the need of an additional insert. The first is the inbuilt, cushioned head and neck support that folds inside the carrier to provide the extra support necessary in those first few precious months. The second is the adjustable bucket seat which easily adapts in three stages to fit your growing baby. The variable settings ensure that baby’s legs maintain the M-shape, ‘knee to knee’ position recommended by health professionals, at all ages and stages of their development. Not only that, it’s been given a nod from the experts as a healthy hip product for babies. As with all its carriers, Ergobaby has put health and safety at the forefront of design, and it hasn’t gone unnoticed. The Adapt Carrier has attracted the endorsement of the Chiropractors’ Association of Australia, and been acknowledged as a Hip-Healthy Product by the International Hip Dysplasia Institute. It’s testament to Ergobaby’s commitment to creating the highest standard of ergonomic safety for babies. Baby wearing can be taxing on your shoulders, hips and back – so Ergobaby has taken the comfort level for wearers to a new high. There’s a new waistband, with double adjustment and extra lumbar support, so you’re comfortable even when wearing bub for a lengthy period. The shoulder straps have easy reach adjusters, and you also now have the option to criss-cross the straps. the Adapt boasts three carry positions – front inward facing, hip and back. The brand new Ergobaby 3-Position Adapt Carrier will be hitting the stores in May – with Baby Bunting exclusively stocking the Black colour option; the Pearl Grey colour will be available at Baby Bunting and other select baby stores and authorised websites.